Groupon is a national deals site that offers different things at a huge discount! My favorite ones for today are for Incredible Pizza Company and Orchard Golf. For $6, you get a miniature-golf outing for two (up to a $12 value). For $12, you get a miniature-golf outing for four (up to a $24 value). For $17, you get a miniature-golf outing for six (up to a $36 value). Remember, since you can use the coupon code more than once, upload and delivery times may take longer than usual due to popular demand, so don't delay and order today. ShopAtHome is offering 50% cash back on Magazines.com purchases today only. 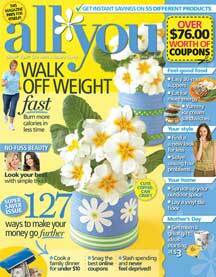 There are tons of great deals, but my favorite is the 2 year subscription to All You magazine for just $17 (or $8.50 per year) after the cash back! That is just 71c an issue which is the lowest price we see on All You! Click on their link to be redirected to their site. You will see an ShopAtHome tracking ticket pop up. Make your purchase of either one year for $19.97 or 2 years for $34. Just remember to NEVER close out the store’s page or you will have to start over. The cash back will not count if you leave the store’s site and return. Within 30 days your purchase the cash back will appear in your account. Plus if this is your first Shop at Home purchase and you sign up with the link above, you will receive a $5 bonus on top of the cash back within 30 days. ShopAtHome.com will send you a check 30 days after you reach the $20 cash out threshold. Since they offer cash back at over 1,000 merchants, that won’t take long at all!